Tommy earned two nicknames during his eventful Liverpool career. One of them "The Flying Pig" was accorded him affectionately by the Kop because of his superb agility and acrobatics for a man of almost 14 stone. He was also labelled "The Sweeper Keeper" by that much respected football man Joe Mercer after he witnessed Lawrence's performance in the 1-0 Charity Shield win over Everton at Goodison in 1966. "He comes so far off his line he plays like an extra defender," was Joe's appraisal of the keeper who shared an Ayrshire birthplace with Bill Shankly but was already on the club's books before his arrival as a manager in 1959. He had signed as an Anfield professional two years earlier after arriving as a 15 year old amateur. Lawrence, whose family moved to Lancashire when he was 11, had to wait until October 1962 to make his League debut but such was his amazing consistency and freedom from injury that he missed only four games between then and 1970. 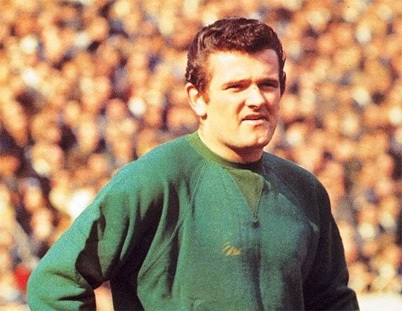 In 1968-69 he set a new record for the old First Division by conceding only 24 goals in 42 games which stood until his successor Ray Clemence was beaten only 16 times a decade later. Lawrence, who won two championships, an FA Cup winners medal and three Scotland caps, joined Tranmere in 1971. The statistics of matches and goals at the top is included in the table by the conducted player of a reserve in a seasons 1970-71 not completely. 1963 v Republic of Ireland; 1969 v West Germany, Wales (3). With it is left on rights: Ian Callaghan, Ian St John, Chris Lowler, Gerry Birne, Tommy Smith, Ron Yeats, Roger Hunt, Willie Stevenson, Peter Thompson, Gordon Milne and Tommy Lawrence, 30 April 1966 Liverpool - Chelsea 2-1 Division One.